Start at 8.30. Today we were lucky that we started that early. Was supposed to stay dry until 14 o’clock. At this moment, as I am relaxing in the hotel in Lillehammer, it is raining. It actually pouring down. I am happy to lay in a bed and watch Birkebener rittet live on norwegian TV NRK. The elite guys are riding now the 94.6km long course. In today’s race I was trying to split up the group in the first climb. 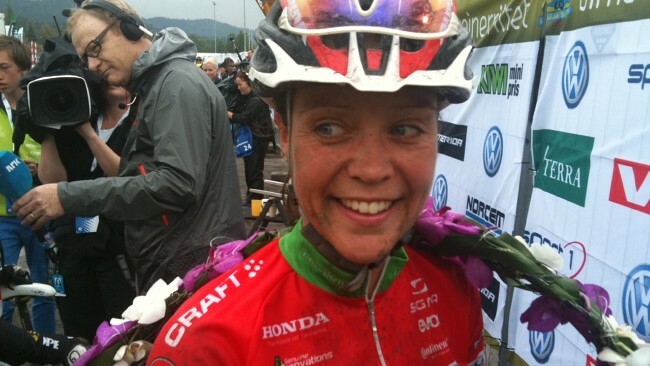 I succeded in that and on top of the first climb, Skramsatdsaetra, I was riding together with Sally Bigham. We continued together until the first downhill and there I surprisingly got a few meters gap to her. As we hit the gravel road I continued on my own, until the finish line. It was once again a great experience to be here at Birkebeiner rittet. The people I passed during the race were cheering at me and this gave me more energy to pedal even harder. Thanks for that!